Rujhan Fabrics Parisha women lawn collection 2014 has been launched in the fashion market and the women are asked to check all these dresses. Rujhan Fabric is a fashion brand, which is emerging quickly in the fashion field and most of the women and girls like to watch all these dresses. This fashion brand has started working in the fashion field few years before and this fashion label has prepared the dresses for the formal, party, semi formal and casual wear dresses. This fashion brand has designed the dresses for different seasons and events. All these dresses are perfect for the women of different ages and the fashion lover women and girls will like all these dresses. This fashion house has launched the collection of the dresses in two volumes and now the latest collection of the dresses is exhibited in the market. 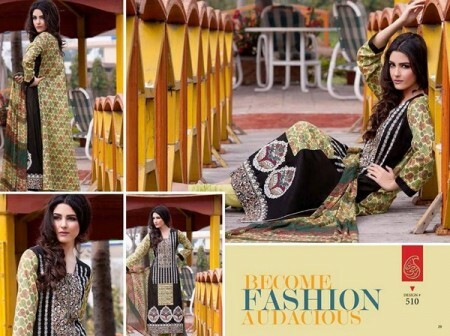 This fashion brand has launched the latest collection of the dresses in the Parisha lawn collection 2014 volume 3 for the women for the summer season and all these dresses are prepared in the eye-catching appearance and the high ends. All the dresses of this collection are prepared in the long shirts and pair them with the trousers & printed dupattas. The dresses are prepared in the prints work and the print work to make them stunning and beautiful. The bright colors as orange, purple, red and blue are used in these dresses. All these dresses are excellent for the casual wear and for the hanging out with the friends. The dresses of this collection are prepared in the attractive colors and latest fashion trends are introduced with the styles of the dresses. There are different pictures of the Rujhan Fabrics Parisha lawn collection 2014 volume 3 for women have been launched in the market and the complete collection of the dresses is introduced on the face book fan page of the fashion label and these dresses are excellent and are available in the latest and lovely styles and designs.